Futures are flat,gold is up 13$,oil is up 0.80%. Feb starts tomorrow. 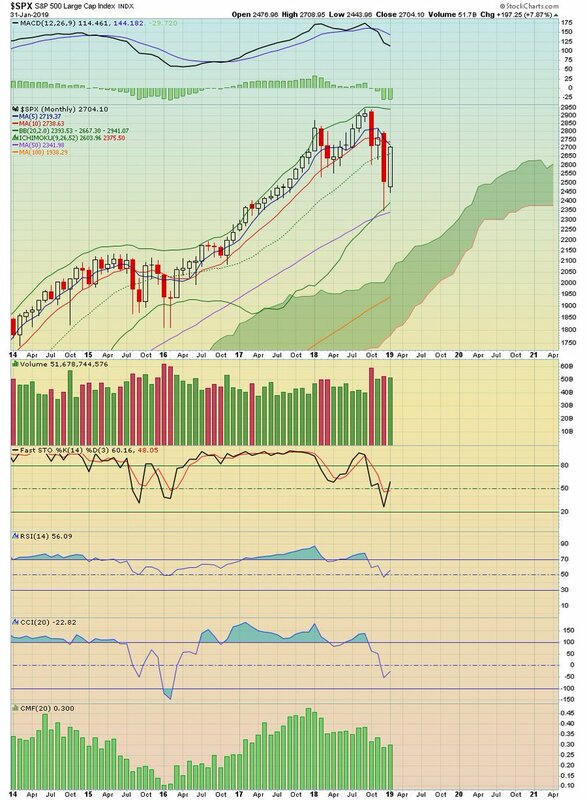 remember monthly chart 5ma still sharply pressuring down for mkt and most of stocks. if ES can't close today above 2712, still big uncertainty into Feb.
$FB monthly chart will close with a super big green candle today for sure, meaning complete technical reversal for long term. if it drops to hourly chart rising mid BB around 160-161 range today, could be gift entry point. but no idea it would drop. ALL 164$ QQQ 1 FEB CALLS are closed at 9.31 am.Will think if i want to roll over next week. Got a few QQQ166$ 1 FEB CALLS at 9.45 am,a small gamble. Well, gold has clearly busted above its weekly Ichimoku cloud. GDX and silver are on the cusp of doing the same. One of my silver miners, AXU, finally got a great pop up today to make back some of the lost ground compared to the metal and gold miners, but other silver miners I own--AG, EXK and ISVLF--are not exploding upwards. Gold is clearly in a second bull phase now and has rock solid support at $1270 based on the cloud, which personally, I highly doubt will even remotely be tested. silver and the miners are not quite there yet. Blah. Of course silver has a 25 cent swing and is red now. Whatever. It should be $500 based on the Fed's psychopathic monetary policy. Maybe the BoJ steps in and rescues the dollar like in 2013. Would be perfect! Last edited by Spanky; 01-31-2019, 11:38 AM. USD's candle from yesterday looks to be completely reversed today. Whatever!!! USD should be dropping like a rock! $amzn earnings undoubtedly will have significant impact on all rest tech names. if AMZN runs super, $nflx at 353 tmr & possibly 380 next week. 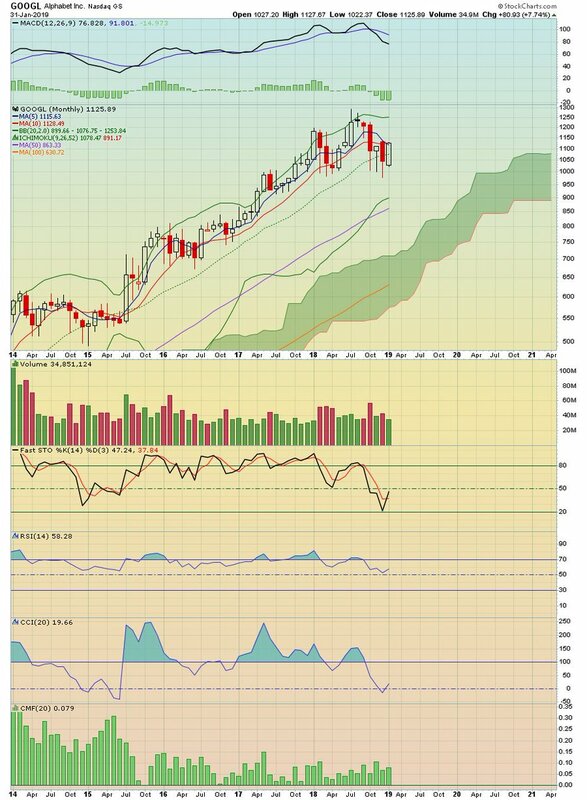 $googl at 1135 tmr & run to 1147 prior to earnings. $fb possibly gap fill to 175.8 tmr & run to 180 easily. ALL depends on amzn. ES2625 is the deciding line. Anything under 2625 is a short. Anything over 2625 is a long. Keep it simple. ES. Next target is 2780. 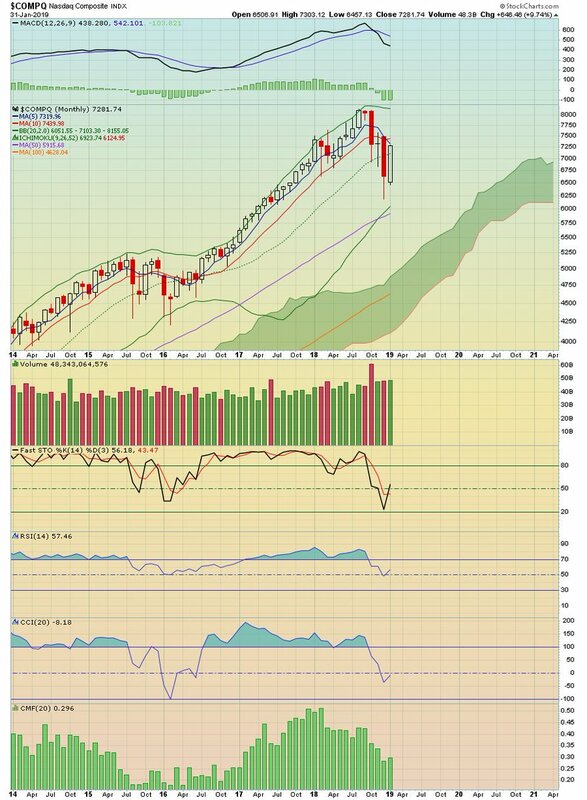 2780 is an interesting spot for many reasons, but it is +20% off the Dec lows. 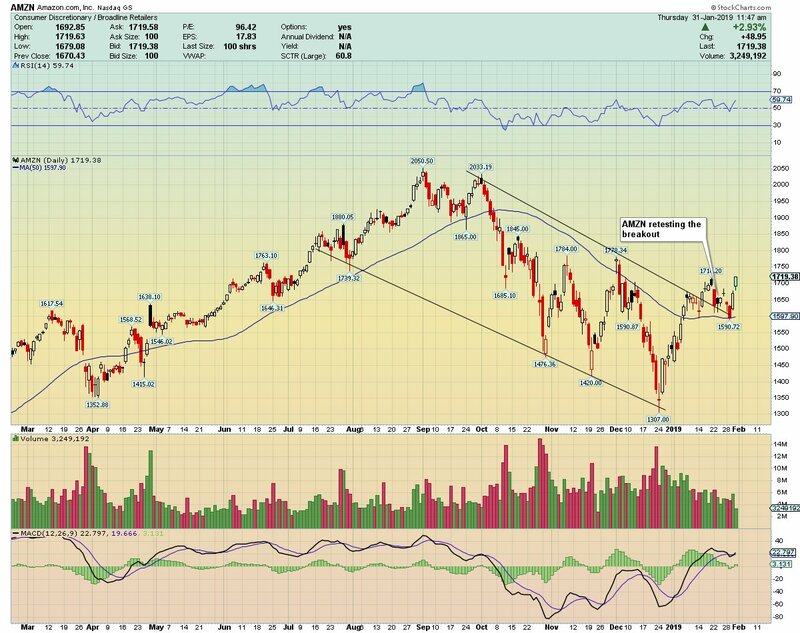 $AMZN ... looking very strong ahead of earnings today. 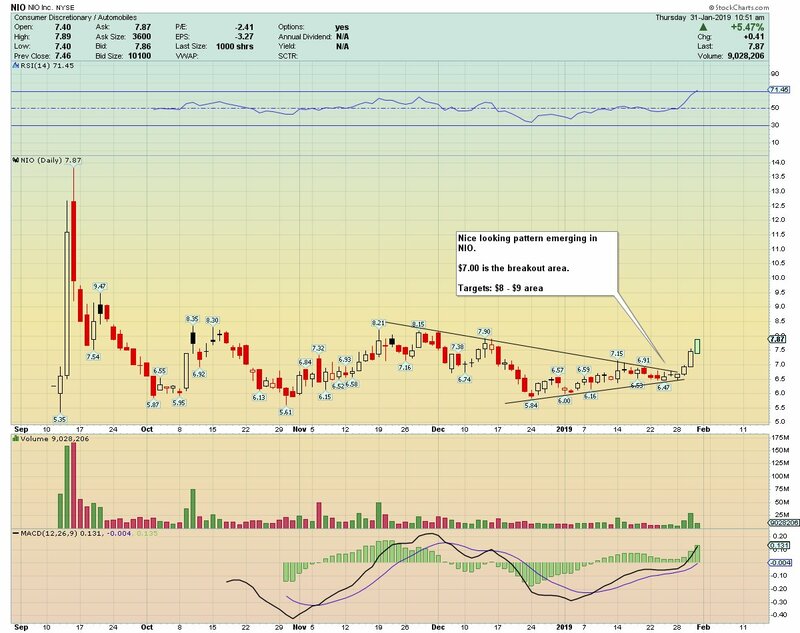 Turning into a beauty this $NIO !! $amzn numbers are great. actually super. but guidance not so exciting. see how it develops. 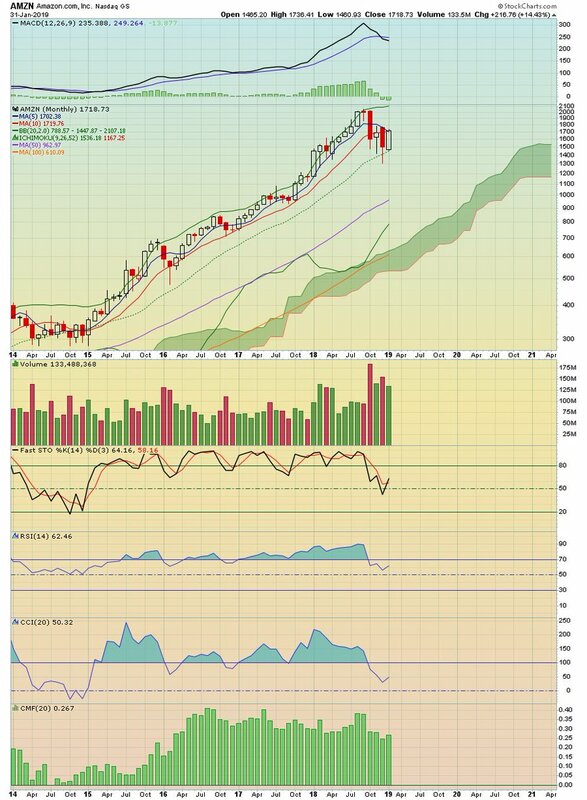 remember if amzn up but only small moves, still good for mkt, especially googl. SoS numbers are quite high today. SPY is not on the list, but very large numbers for the top 10 or 15 stocks on the list. Since its IPO in 1997, Amazon has made $20 billion in cumulative net income. Apple made $20 billion in net income last quarter alone. Amazon market cap: $840 billion (largest company in the world). Apple market cap: $787 billion. #FANG monthly chart update. 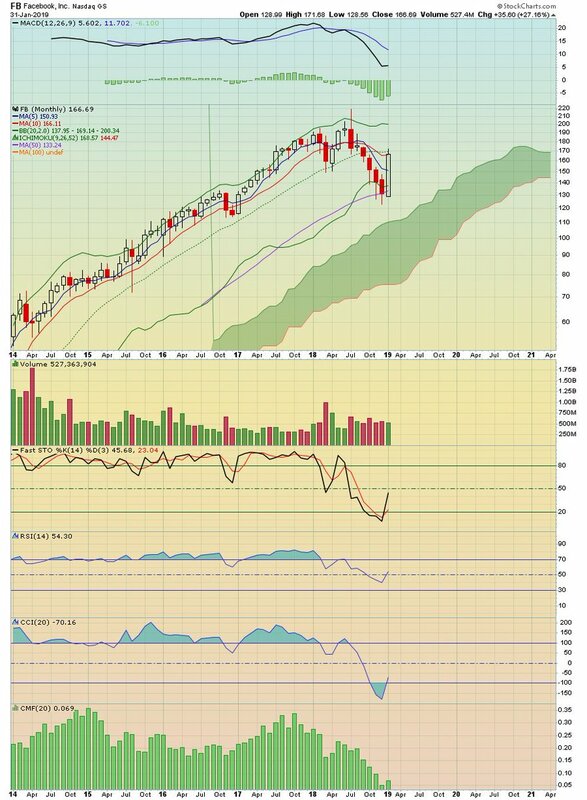 $FB huge reversal candle closed above 10ma but below mid BB $AMZN higher low BUT below closing price of Dec w/ lower high. 5ma dead cross 10ma. 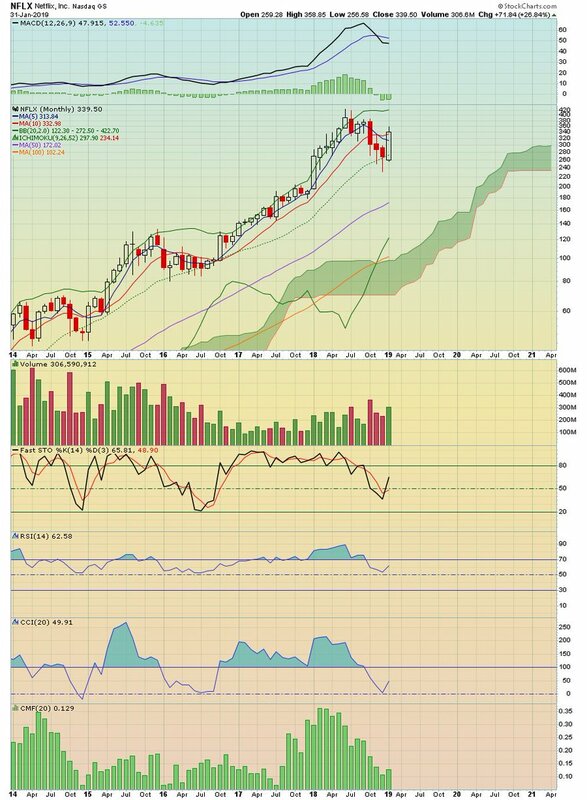 Feb Mar consolidation $nflx double bullish engulfing closed above 10ma. BEST among FANG $googl same as AMZN.